A competitive athlete all her life, Lisa understands the benefits associated with disciplined training programs. A competitive tennis player in high school, she was ranked #1 in Maryland and won the National 18 and under doubles championships. She was coached by one of tennis’ all-time champions, Grand Slam winner Donald Budge. In college, Lisa was an All-New England and All-American Field Hockey and Lacrosse Player at Trinity College in Connecticut. She relishes the team tactics and strategies associated with cycling, and has encouraged women to participate in cycling and bike racing. 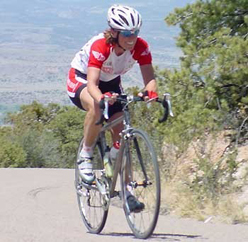 Since moving to California in 1995, Lisa has raced with some of the top teams in Northern California, including Twin Peaks/Una Mas, Start to Finish and The Olympic Club. After retiring from racing at the national level in 2006, Lisa transitioned to managing women’s pro cycling teams, including ValueAct Capital (2007-2009), Team Vera Bradley Foundation (2010) and Team TIBCO/SVB (2010). Lisa is currently an Independent Sales Rep, working with brands such as SCOTT Bicycles, Alchemy Bicycles, Craft Sportswear, 2XU and Lake Cycling Shoes. Lisa lives in Marin with her husband John and their two cats, Sox and Simon. If you have any questions feel free to contact Lisa.